Discussion in 'Articles' started by xcel, Jun 22, 2006. Let me take this opportunity to thank Dan Kroushl (Krousdb) who taught me the Pulse and Glide technique for Prius II’s last year. I also want to credit my “Prius Marathon” friend and co-driver Dave Bassage and Internet friend Bill G. for their help in making P&G one of the most important tools in my own hypermiling toolbox. Both Hobbit and Graham Davies should be credited for discovering/describing “Warp Stealth”. Doug Schaefer for taking the time to clean up and brigten some of my less then spectacular pics. And finally Carl H. for both his time and the use of his Prius II for many of the pictures below. 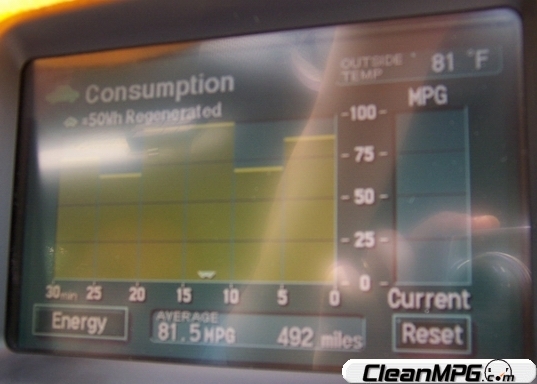 A friend of mine from work, Carl H., used to receive the upper 40’s/lower 50 mpg’s in his 2005 Prius II from the time he drove it off the lot through late spring/early summer of last year. With what I was taught in regards to P&G via E-Mail from Dan, Dave, and Bill, I passed along the technique as I understood it to Carl and his FE went from that higher 40’s/low 50’s mpg mark to the low to mid 60 mpg mark seemingly overnight! As his Prius II has broken in, temps have warmed in Illinois again, his Prius II’s setup is almost perfect, and he has become more adept at using the P&G technique in situations where it would be applicable, he is now punching out 70 and 80 mpg tanks over his own 25 + mile commute! His use of an alternate route paralleling the Interstate has allowed the ability to run within the P&G constraints for much more of his commuting distance allowing him to almost but not quite double his FE from Day 1 until today! With these real world results, I hope you can both learn and use the technique(s) when and wherever applicable in your Prius II as well. Without further fanfare, here is the P&G and “Warp Stealth” technique(s) in both explanation and with pictures so you can learn from and use them while driving through your daily grind as well. “Pulse” is any acceleration from a lower speed target at a rate to keep from drawing off the pack while also filling the pack (Green Arrow from the MGSet to the Pack on the Energy Monitor screen). You do not want to see Orange arrows from the MGSet to the Wheels on the Energy Monitor screen. Our intent during the “Pulse” phase is to get up to a top target speed less then 41 mph in which you can quickly and smoothly transition to the “Glide” phase. Any top speed target will work to fit a given traffic condition as long as you maintain less then 41 mph for the highest FE. That was the explanation but how do you actually “Pulse”? Using a 30 mph to 40 mph band as an example, when you are cruising along at 30 mph, you step into the accelerator just enough so as to not see assist from the pack (as described above) and fast enough to maintain an average “Pulse” rate of your choosing. You can control your “Pulse” rate of acceleration but you do not need to maintain an exact rate as seen in the pics below. A 20 mpg average “Pulse” rate may include an initial 17 mpg rate when you first start the “Pulse” and maybe 23 mpg “Pulse” rate when you hit your top target speed before you transition to “Glide”. For a 40 mpg average “Pulse” rate, you might see a 36 mpg “Pulse” rate when you begin your “Pulse” and a 44 mpg “Pulse” rate just before you enter your “Glide”. 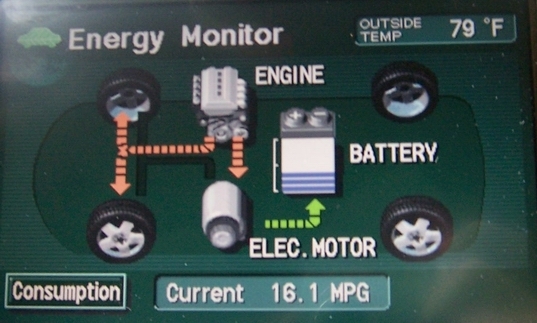 To recap, you gently step on the accelerator enough to get the ICE to spin up and provide propulsion with the energy screen showing ICE power to the wheels and power through the depicted MGSet to the pack while the digital iFCD readout is showing anywhere between 15 and 55 mpg for the acceleration back up to 40 mph or less. Example of a 40 mpg Pulse rate. “Glide” is the coast down mode that can be a bit tricky. What you want to see in your Energy Monitor screen is the ICE-Off and no arrows from anywhere or too anywhere (Black Screen) while you are coasting down from the top “Pulse” target speed to the lower target speed for a given traffic condition. This allows little to no loss of momentum via Regen or providing “Electric Only” propulsion to the wheels. The way the “Glide” technique is implemented is that you hit the maximum target speed below 41 mph during your “Pulse”, let off the accelerator just a touch for a fraction of a second to shut down the ICE and induce a touch of Regen (best if you can skip Regen altogether), then press down on the accelerator ever so slightly to achieve and then maintain blacked out arrows all around with the ICE shut down, no regen to the pack, and no pack to MGSet to wheels propulsion down to the lower speed target. The blacked out arrows on the energy screen tell you that you are in or very close to being in this almost coast free state. You will need to practice this in your Prius II as it is not intuitive. I am sure most have probably been told by whomever that Regen is a hybrid’s real technological advance. It can be in circumstances when you must come to a stop before you had planned without the ability to “Glide” much of that distance. Many hypermilers evoke Regen for SoC management, when confronted with an uncontrollable slow down during a heavily congested traffic situation, or when a blown light timing forces an abrupt stop. Just remember that a pure “Glide” from 40 mph and below as well as “Warp Stealth” as described later on in the article from much higher speeds works. With a little practice, you will be able to enter into and out of “Glide” mode at will while just using your right foot on the accelerator. You may consider using a small amount of EV to maintain a slower speed and or crest a small peak so you can continue your glide down the back side. There are limits to EV so use it sparingly within the P&G technique and only where it can extend your Glide for even higher FE. The following equation will show you what you will need to achieve for a given target FE. Pulse distance * [(Target FE mpg/Average Pulse Rate in mpg) – 1] = Glide distance needed to achieve target. For a 100 mpg target goal, the following equation and examples of differing Pulse rates (Average FE during the Pulse) will give you your glide distances needed to achieve your 100 mpg goal! Pulse Distance (miles) * [(100 mpg/20 mpg) – 1)] = Glide Distance (miles) needed to achieve target. .2 miles * [(100 mpg/20 mpg) – 1] = .8 miles of Glide to achieve 100 mpg over a total distance of 1 mile. .2 miles of Pulse at a 20 mpg pulse rate with .8 miles of Glide will give you a 100 mpg. .3 miles * [(100 mpg/30 mpg) – 1] = .7 miles of Glide to achieve 100 mpg over a total distance of 1 mile. .3 miles of Pulse at a 30 mpg pulse rate with .7 miles of Glide will give you 100 mpg. .3 miles * [(100 mpg/40 mpg) – 1] = .45 miles of Glide to achieve 100 mpg over a total distance of .75 miles. .3 miles of Pulse at a 40 mpg pulse rate acceleration with .75 miles of Glide will give you 100 mpg. .4 miles * [(100 mpg/50 mpg) – 1] = .4 miles of Glide to achieve 100 mpg over a total distance of .8 miles. .4 miles of Pulse at a 50 mpg pulse rate with .4 miles of Glide will give you 100 mpg. Prius II “Pulse” Sequence #1: RR Crossing sign is ~ 1/3 mile ahead. Time is 11:38 AM. “Pulse” rate: ~ 24 mpg. Speed is ~ 33 mph and climbing when the picture was taken. Pulsed to ~ 35 mph due to (2) sharp turns after RR tracks ahead. Notice 3 Blue Bars on the SoC graph. Prius II “Glide” Sequence #2: Notice RR Crossing sign a hundred + yards ahead. Time: 11:38 AM. Proper “Glide” showing no Arrows. ~ 33 mph and decelerating slowly in the “Glide”. Notice 4 Blue Bars on the SoC graph achieved during previous “Pulse”. To wrap up the tutorial on P&G, you want to accelerate up to a maximum of 40 mph in the “Pulse” phase, begin the “Glide” phase and coast down to a lower target speed. Once the lower target has been reached, you want to reinitiate the “Pulse” phase, re-accelerate back up to a maximum of 40 mph using the energy screen as displayed, and repeat when and where applicable. The Prius II is very flexible in terms of how to apply the P&G technique to a given traffic situation. You can “Pulse” at any rate between 15 and 55 mpg, “Pulse” to a target of 40 mph or any speed under that depending on what traffic allows, and “Glide” from the higher speed “Pulse” target to any lower speed including stopped! It only depends on traffic conditions around you. For most, a “Pulse” w/ a 17 - 23 mpg acceleration rate might be best to keep up with normal traffic acceleration rates and compress the P&G speed range to between 33 and 39 mph while driving on a 35 mph limited roadway or in traffic tie-ups and jams that allow it. While P&G’ing between a 33 and 39 mph range, a car behind on the 35 mph limited roadway can barely perceive you are driving any different then they might be themselves! 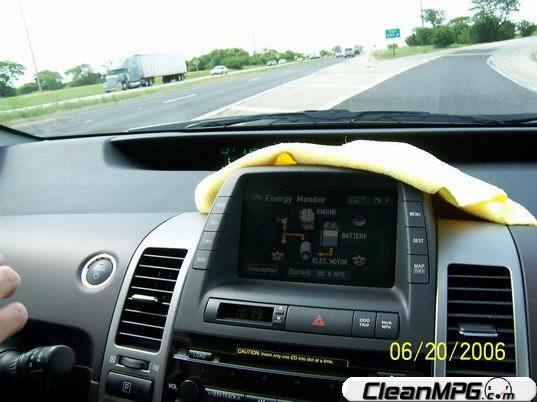 P&G will push a Prius II’s average FE over a given distance through the roof when and where it can be implemented. The large band and lower target speeds may make the P&G technique un-usable under a multitude of traffic and or roadway conditions you may drive through on a daily basis. When in those non-P&G friendly conditions, drive as any hypermiler would with only a portion of the tools available and save the P&G technique for when and where it can be applied safely and correctly. Interesting 5 minute bar graphs above. First 5 minute bar: Country road transition to a short State Route jaunt. Second 5 minute bar: Short State Route and transition to country road. Third and fourth 5 minute bar’s: Country Road. Fifth and Sixth 5 minute bar’s: Heavily traveled city/suburban roads with ~ 90 mpg average over the 30 minutes. Carl's previous record tank may be bested by 8 mpg's and possibly more? Still at 1/2 tank too! What is the “Warp Stealth” technique all about? Since I personally have < 20 miles in a Prius II at highway speeds, I can only describe what I saw on the Energy Consumption screen while exiting the Interstate multiple times early yesterday afternoon. Carl has been using this technique for a while to great advantage when under higher speed conditions. I was astounded seeing it for the first time with the ICE-Off under a type of EV mode while far above the 41 mph MG1 limits. Hobbit lightly touched upon the technique a few weeks ago in the thread entitled Throttle Control. MG1 is spinning backwards at a very high RPM as it should in this condition. Warp Stealth is very similar to the HCH-II’s EV/Glide mode in which the ICE is spinning while in Fuel Cut. With a slight amount of EV, you can slow the deceleration somewhat but a HS “Glide” is where the Fuel savings will make this technique a good one for those traveling the highways and byways of America. The 2 pictures below should explain exactly what you will see while the Pack draw is minimal when coaxing the Prius II into this condition. For a more detailed description, please read Hobbit’s page on: “Warp Stealth: a Prius driver's guide.”. Prius II Full Picture - We were decelerating through 48 mph at the time I snapped the picture while coasting down onto the off-ramp from a short highway jaunt. This is “Warp Stealth” or HS “Glide” while exiting I-55 in North Central Illinois. To enter into “Warp Stealth” from a higher speed cruise, you drop back on the accelerator a small amount and enter into a slight slowdown with a very light amount of Regen for fuel cut. Skip the Regen just as you do when entering “Glide” if at all possible. The Energy Screen should show an ICE-Off condition. Slowly reapply the accelerator (exactly like you would to enter “Glide”) which eliminates any Regen if you did inadvertently evoke it. You should see the pack come online to keep the ICE (still in Fuel Cut) spinning yet off at a rate to protect MG1 and/or help push the car via MG2 a small amount. How can “Warp Stealth” be exploited besides for a high speed “Glide” (41 mph and above) and transitioning to a std. “Glide” (below 41 mph) while coasting down to an arterial from a Highway Off-ramp? I have the distinct feeling “Warp Stealth” can be exploited similarly to P&G below 41 mph but at highway speeds? 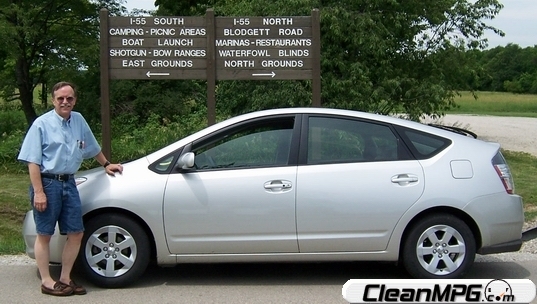 A HS P&G may be an area some Prius II owner would like to explore. I am positive it will not yield the same types of FE increases as a standard P&G below 41 mph will but you may see a nice increase over and above the Prius II’s standard higher speed cruise. This higher speed cruise is where the Prius II begins to consume fuel at a rate some may consider unacceptable and especially when compared to its capabilities below 41 mph? I will leave this question open until either Hobbit or another serious Prius II hypermiler can take the technique to its final conclusion. Finally, please practice the technique(s) above on roads with little to no other drivers around until such time they are second nature. There is a risk you will be paying far too much attention to the Energy Monitor display while learning/practicing instead of the road ahead as you normally do! I am sure we all know what the consequences of this inattention could lead too so please for all our sakes, be very careful out there. I think, but more data are needed. little more data off the CANbus. P&G but it's not quite fast enough to run steady-state ICE-on. Great job describing png in an easy to understand manner. The pictures are great because it gets across what drivers need to be seeing on their energy monitor without words getting in the way (and maybe being misunderstood). I think I am starting to get the hang of pulse and glide and have managed some 20 mile segments at close to 90 mpg, but I can't seem to get past 90. I think part of the problem is roads with speed limits of 45 to 50, I need to find a route with more roads of 35 to 40 mph speed limits. If it were you (master hypermiler that you are) and there was no traffic to consider, would you choose the slower acceleration for your pulse in the prius (say around 50 IFE) to maximize fe or the faster acceleration (20 IFE) assuming flat terrain? I think I have said this elsewhere (but in case I forgot and only think I said it), your article on warp stealth is great! I have been trying to use this to boost fe at speeds between 40-55 mph. For those of us without canview or scangauge or some means of monitoring RPM can you roughly translate your ranges for RPM into ife on flat ground (I realize the ife will be different at 2200 RPM depending on whether you are going uphill or downhill and the steepness of the hill.) For example at 2200 on flat ground the ife might be 30-35 mpg but up a steep hill it might be 10-15 MPG at the same rpm. Thanks. report -- the IFE while doing the experiments on the highway. you faster, your miles per those little milligallons is higher. at that point. So let's say somewhere between 55 and 75 mpg. in this case about 40 hp that I rarely go beyond in demand. Thanks for the excellent description, Wayne. I found some of the images too dark (on my monitor at least), and have brightened up 9 of them with PhotoStudio. I am uncertain how to post those images back here so that you may incorporate them into your document if desired. Advice please. Just so I am clear, when you suggest expanding the range to improve fe, are you referring to the speed range? Instead of 33-39 mph, try 20-40 where time and traffic allow this to be done safely? Thanks for the advice. ___If you can, go ahead and expand the range. 20 to 40 might be a bit large for most roads but if no one is around, why not? I would think a 25 - 37 mpg range would be a good solution for a 30 - 35 mph limited roadway so as to not cause too much trouble on both the low side and the high? You know, speeding and all Out on a desolate road, the throttles are wide open. ___Tochatihu, when I get off night shift in 3 days, I will send you the final rotated/leveled, cropped, and re-sized pics as well as the RAW originals so you can play with them at your leisure. It was so bright during the limited testing that the pics posted are some of the better ones after I lightened; changed contrast, and Gamma levels on some of them already. Hi Philmcneal, gliding is definitely possible in the NHW11 Prius. It is simply that I am not very good at the whole range of FE techniques. One thing that I intend to do is switch to weaker return springs in the accelerator pedal. But my supply of spare accel pedals keeps getting depleted. I repair the failed ones as a hobby. Wayne I don't know if I can work with RAW images. JPG is the most familiar. Yes I can. RAW image files are quite another thing. Great article Wayne, this helps others having a hard time understanding P&G. Every car I drive, I see an increase in FE using P&G now. It’s like learning how to avoid the brakes, but you learn how to limit the gas pedal in addition. Unless the Prius does not have a wheel end or center axle disconnect, I can’t see that deadbanding would be preferred over neutral for the glide. It may be possible to check the Prius owner’s manual for the towing requirement restrictions. If they advise it’s ok to tow in neutral, there may be an axle disconnect like the FEH. Higher P&G speeds will never yield you better FE than under 40mph, but they are better than no P&G at say 70mph. P&G is always in the cards for me at any speed. It’s all in the management of how to limit the use of the gas pedal and coasting or gliding. So what if at speeds of 70mph you slow faster, your going to yield better FE over pushing a constant speed of energy because you demanded less during coasting time. Every condition requires adjustments in our daily grind, P&G is part of the tools I use thanks to the people here responsible for P&G. ___As for Deadband, this is a description of “only” power flow to the wheels via the ICE (not the MGSet and back to the pack) during a “Pulse” in Prius circles. I never really liked the term or the ability to see/achieve it so I left it out of the discussion so as to not confuse anyone. The std. “Pulse and Glide” as described is the real “killer app” approach to maximum FE in the Prius II. The FE from “P&G” works so well that I can only hope most Prius drivers will add the P&G technique to their toolbox ASAP. ___An additional item … Because of our 2 hours of taking pics and pushing Carl’s own Prius II for the article, I gave him some pointers on the return loop to improve upon his already spectacular tanks. With that, he is now successfully running 95 - 100 mpg segments from home to work and back vs. the 70 - 80 mpg segments previously. Keep a close eye out for this guy in the coming months because I think he has a shot at the first 95 - 100 mpg tank in a Prius II (no small feat as all of us know) while simply commuting back and forth to work with the few additional tweaks to his technique we had the opportunity to discuss. ___Finally, I would like to tweak your FEH article somewhat when it cools down in your locale later this year. What I would like to do is add some additional pics of the NAVI’s - Energy screen during the different phases of FEH LGA-N-D for EV ops as well as add a video loop with appropriate commentary to describe it even better. Maybe I can take a trip down your way w/ the digital camera and video recorder to lock it all down in late fall when it cools off. I was reading over my older Word Documents describing the Prius II specific P&G before I wrote this article and came to the conclusion I probably buried more people in detail then helped. For this article, I decided to capture on camera a very specific grouping of pics (P&G in the Real World Sequence), very exacting pic’s of the various “Pulse” rates, “Glide”, as well as “WS” as it was actually seen during the event(s). Although my pics were of poor quality, I believe it is much easier to understand the what’s, why’s, and how’s from the pics now vs. the excessive verbiage I had used in the past to describe the same technique(s) in other areas of the web. I would like to do the same for your FEH the next time we get together so as to help current and future FEH owners understand how the LGA - N - D for EV and FS is accomplished. PS: Great thread on maintaining your FEH’s FE while using A/C to keep you and the pack at a much more comfortable temp given your location too! If you have not been sworn to secrecy by Carl, could you share some of the pointers you gave him? Undoubtedly there are others (me for instance) who are making some of the same "mistakes" as Carl was (I can occasionally pull off an 85-89 mile segment over 20 to 40 miles), the occasional highway or short errand trips kill my overall tanks. Today I had a eureka moment (inspired by your article) while driving up a long hill. In your article you emphasized the distance of the pulse and the distance of the glide. I have often made the mistake of thinking in terms of the time spent with the ice on vs ice off. This would lead to hard acceleration at say 20 mpg so that I could spend less time with ice on and more quickly reach the ice off glide. This might make sense on flat ground and would also make sense going downhill, but going up a long hill it is unlikely that one can reach the ice off state for any length of time. If the ice will be on over the distance of the hill (call it x) why not go as slow as traffic and time will allow and get maybe 40 to 50 mpg over the distance x, rather than trying to get to some target speed like 40 mph more quickly and maybe end up with an average of 20-25 mpg over that distance x. Once you reach or get close to the crest of the hill you can use a little ev to get you to your target speed if SOC allows or once reaching the crest you can let gravity take over if the hill is steep enough, if not use a little more ice or ev to get to your target speed and then glide. You have often stated that lower rates of acceleration are your preference, and for hill climbs I am definitely seeing this, I think on the downhills and the flats acceleration at 35-40 mpg up to target speed works well. Another observation is that target speed should be adjusted down at the top of a hill because gravity will often take you up to speed relatively quickly so if your target speed is 40 only use the ice to 35 or so (depends on the steepness and length of the hill). ___What I explained to Carl is to move into and out of the 2 states a bit quicker and hold the “Glide” longer by widening the range. I noticed his accel rates were slowing as he approached the higher target speed and thus he was ICE-On for a longer period then he needed to be. I also guided him towards using EV at the bottom of the range a little longer so as to extend the “Glide” distance as well as use it to crest in a decal to regain speed on the descent. You have already discovered this last item by the latter portion of your reply. Given the way EV works, you want to transition to “Glide” before you crest, bleed off speed to the lower target and then EV over the crest for a full “Glide” accel on the descent of whatever you are climbing. The last thing was to begin the “Glide” a bit further from a known stop so as to DWB. It wasn’t much but when you put it all together; he is now besting the 100 mpg barrier on a much greater portion of his route. ___We do not have the types of hills on Carl’s Alternate Warm-up P&G route where DWL can help much within the P&G technique but in any climb, I would DWL to a mid speed target, transition to “Glide”, bleed off speed to the lower target, then EV over the crest giving away kinetic for potential smoothly. After the crest, your newly gained potential can help you back to a nominal speed with ICE-Off for the illustrious extended “Glide” we are all looking for. ___There are other tools so as to reach the illusive 100 mpg segment goal but it involves swapping back and forth between the Energy and Consumption display or having a Yoshi supplied SuperMid connected. I would prefer most simply keep the Energy display up so as to transition between “Pulse” and “Glide” smoothly and efficiently with the least amount of distraction. 100 mpg will be in their future if they can find that section of road or traffic condition that allows the technique to be exploited to its final conclusion. I really appreciate that you take the time to answer my questions, hopefully there are others besides myself who will benefit from your tips. I mostly use the energy monitor and occasionally check consumption to see how I am doing. In order to check how my individual trips are going, I use the method you employed with Carl's Prius when you first tried pulse and glide in the prius last summer (I am a fan of yours in case you couldn't tell), so by noting the avg mpg on the consumption screen before and after a trip and recording the number of miles of the trip I can calculate an approximate avg mpg for the total trip (I only reset when I fill up). Other than this I am not sure how one would use the consumption screen except maybe to see where the 5 minute bars are (occasionally I get 2 consecutive bars at 99.9) or to see if the avg mpg is increasing or decreasing, it is not that hard to take a quick check in the middle of a glide or at a stop light, the hills tend to prevent me from maintaining the high mileage, but I am going to try some of your tips and I'll let you know how it goes. I finally checked Carl's stats over at green hybrid, I would agree with you that pretty soon he will be giving Dan K, and Lakedude a run for their money, 76 MPG may be the best tank ever, (besides Dan) in a Prius. No doubt he will surpass Dan's 86.7 tank soon and Dan will have to take the Prius back from his wife. I can't imagine what you would be able to achieve driving a prius all the time. with what I hope is the answer to all their prayers. Great writeup. I have been struggling with FE at speeds over 40 mph and especially on the highway, so this is exactly what I have been looking for. I usually manage around 55 mpg on the highway at average speeds of about 63 mph, I have tried using warp stealth and high speed p&g but at highway speeds I usually do just as well with cruise control and switching to high speed glides on the downhills. I have no added instrumentation (I am thinking about a scangauge or supermid m1) so I will need to base my technique on iFCD until I add something to show me vacuum and RPM. You suggest staying between 35 and 75 mpg on the iFCD, I assume 35 would be going uphill or accelerating and 75 on slight declines or flat ground once up to speed and obviously 75 would be better than 35 all else being equal. What is not intuitive is why iFCD readings between 75 and 99 mpg would actually result in a lower overall mpg than say 60 to 75 mpg. Is this because you would not be at an optimal point on the Torque vs RPM curve (with the RPM being too low) when above 75 mpg instantaneous? I often strive for the highest possible iFCD readings without realizing I might actually be hurting my avg mpg (except when in high spped glide), it is counterintuitive, but I certainly will give it a try because I would be quite pleased with 63 at 63. One thought is that by staying higher on the torque curve and getting up to say 65 or 66 mph, you can then go into high speed glide and let the speed bleed off to say 59 or 60 mph and then pulse back up to 62 mph or so at say 40 to 50 impg (instantaneous mpg) on flat ground and then let up a little on the throttle and try to keep it at 70 impg. If you continue to accelerate up to say 66 mph then let up a little more and go into high speed glide down to maybe 58 mph or so. Is this what you have been doing? I realize you are basing your throttle position on your sweet spot meter, vacuum gauge, and rpm and not so much on iFCD, but a little more detail on how to approach this technique without extra gauges would be of interest to many. It sure looks like the scan gauge is going to be my best bet to try and nail this thing. Thanks again for sharing your findings. ___I had planned to create a thread about this in the tech section given it could get controversial … The reason why is because we are going to be in a debate of sorts here. 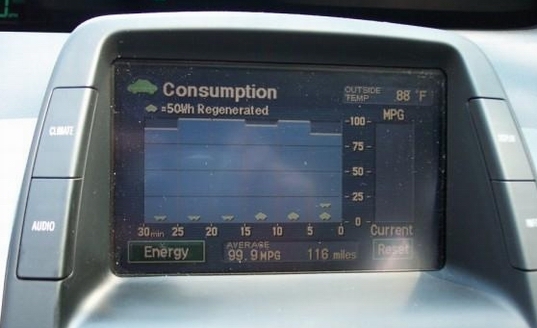 ____Rick Reese took his Prius I to a 70 + mpg tank using a simple Graham scanner. He found two areas where higher FE could be achieved while only concentrating on the load section and built in iFCD. IIRC, it was something like a 25% and a 70% load area (load being ??? on the Graham Scanner) where the magic appeared. ___Because you have had little to no time behind the wheel of an IMA equipped Honda hybrid and its superior instrumentation; you will find various throttle position that not only increase FE but maintains a given speed. All Honda IMA drivers actively seek out and ride this slight less throttle position while maintaining the highest FE per the iFCD possible at a given speed. Hot Georgia has spoken of this many many times in the past in fact but you can usually gain 5 – 10 mpg’s just by following the iFCD … The same should hold true in the Prius I/II. Set it up and continually adjust to get that aFCD to max for a given speed. I think you may be limiting yourself by burying the details inside your gauge package. Just a thought but if you give a Honda Hypermiler the Prius II for a week, he/she will seek out and find the same using the Consumption display’s iFCD but will be varying the TP as road conditions, traffic, and weather/temperatures vary.